Everything about the 4th annual Trans-Pecos Ultra 2018 was très bien. Formidable, even. That’s because it was dominated by a highly experienced French multi-sport athlete, Démétrio Fernandez, a 10-hour Ironman and veteran of many stage races in exotic venues. He led every stage in the 6-stage race, finishing with a total time of 36 hours, 26 minutes for the 163 miles, just an hour off the course record. At 55, Fernandez is nearly twice the age of the record-holder, Adam Harmon, who set it in 2017. 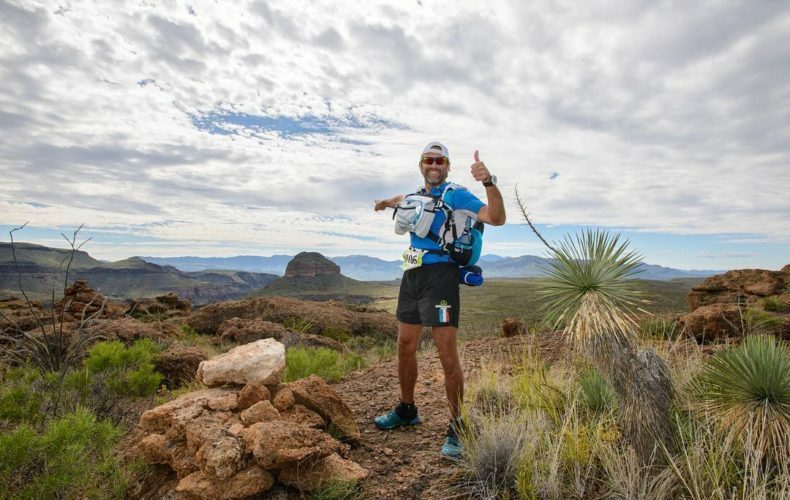 Fernandez had high praise for the friendliness of other runners and volunteers, which managed to communicate itself even though some language challenges. In overall second place, with a final time of 46 hours, 23 minutes, was Stephane Lorre, another Frenchman whose position at the embassy in Washington DC has given him a facility with English, making him the de facto translator for Démétrio. The two Frenchmen have been traveling together for years to ultra endurance events, mostly in Europe. Third place overall belonged to an American runner, Doug White, with a time of 49 hours, 2 minutes. Despite a cranky knee that developed mid-week, Doug held on to some early speed and finished just a few hours off the second-place winner. As a TPU volunteer from 2017, Doug was very familiar with the course and the self-supported ethic of the run. Stage racing is a still new phenomenon for most American runners. It has a longer history overseas, so it is not terribly surprising to have experienced European stage runners in the lead. The international website, StageRaces.com, lists over 100 trail running stage races in the world, but only 4 are expedition-length (week) events in the US. TPU features up to 6-stages in 7 days of self-supported running or hiking. New in 2018 was the 4-stage option (81.9mi) for those who couldn’t get away for the whole week. “Self-supported” means that racers carry their own safety gear and food for the whole 163 miles. The only elements supplied by the organizers are water, shelter and medical aid. That is typical for multi-stage races overseas, like the iconic Marathon des Sables in the Saharan desert. Adding to the challenge, participants have no cellular or internet connection in Big Bend Ranch. Communications are handled as necessary by race staff via satellite phone. The experience of being far removed and unplugged from modern life is one of the greatest gifts of being at TPU for a week. With an average elevation around 4500′ and only 14,000′ elevation gain over 163 miles, TPU is not as beastly as some other ultras, but there is plenty of obstacles, with many varieties of cactus, some of which are unavoidable on the trail, plus sandy river bottoms and steep descents and ascents of an old volcano crater and several volcanic peaks. The unusual rainfall in the rest of Texas this fall penetrated even to this normally-parched desert area. Stage 1, the prologue, and Stage 2 were completed under unusually overcast skies. Finally, on Stage 3, the clouds gave up the game, and let loose a downpour on the runners. Stages 4, 5 and 6 enjoyed days much closer to the Big Bend norm: blue skies, with puffy white clouds and magnificent sunsets. But once the sun came out and turned the canyons into convection ovens, the runners got nostalgic for the rain. As in prior years, both runners and hikers completed the race. The first-place female Rani Freeman, hiked an impressive pace throughout the week, without running at all. It was obvious how much fun she was having by the enthusiasm she displayed at each stage’s finish line. Rani had been to Big Bend many times before, and relished the opportunity to spend long days in her version of paradise. There are few unexplored areas like Big Bend left in the country. Big Bend Ranch is not as well-known as its larger, national park sibling (Big Bend National Park), but the natural history and astronomy of the area is equally compelling. Such features are almost as much a part of the week as running and hiking. The Big Bend is a whole network of unique ecosystems, and home to species not found elsewhere in the world, as well as one of the world’s “darkest skies”. It gives one pause, as well, to look over to Mexico and ponder the significance of the border area. TPU racers go home with an experience that is shared by a very few people. The TPU race community is rich and diverse. This year, in addition to the Frenchmen, we had an Appalachian Trail thru-hiker, a first-time ultra runner and an endurance cyclist. The TPU race format attracts a great variety of athletes, to the overall advantage of the sport. Data analysts at Human Potential Running have shown that the growth in US ultra finishes is flattening out, primarily because more ultra races are being created than can be supported by ultra runners. The answer is to attract more runners to the sport, but how is that to be done? One answer may be to explore different kinds of ultra running. For example, many of our TPU finishers had never done a 100-miler or even a 50-miler ultra. But when the mileage is spread out over a week, when the cutoff times are generous enough for hikers, when the race is more of a VIP getaway to a remote destination than a one-day excursion… the market opens up.